It's An Enormous Maze Trapped Inside A Ball! 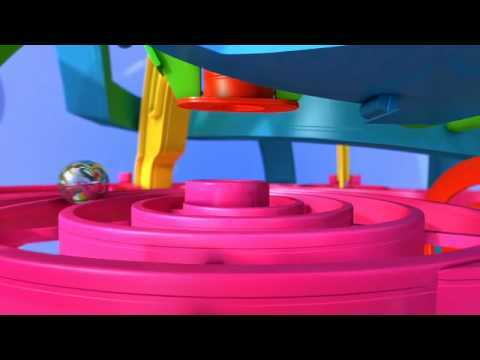 Addict-A-Ball is an astonishing 3D maze which twists and turns through the middle of a ball. The aim is simply to get the ball from the start of the maze to the finish without it falling off the maze! The start of the maze is simple enough, but it lulls you into a false sense of security as the ball suddenly starts tumbling down stairs and slides and you even need to negotiate a bizarre swing! True to its name, once you've started, you won't want to put it down until you have succeeded. Fabulous! Why do you like ADDICT-A-BALL? This game has been described as a 'theme park in a ball'. Everything about this puzzle is exciting and engaging. It's very addictive and you will not want to put it down! It's fun but you have to be skilful. We like a challenge but sometimes we fight over it - not seriously! Would this be suitable for a 6 year old or is it a little too complicated? It does not really matter how old you are, it is more about hand eye co-ordination. Our 6 year old loves his that is why Addict-A-Ball is so great!